Thursday March 9 1911 Will went to town this morning and made a $650.00 loan to S. [Foinall?] on Dakota land. I went down at 2.30. Did errands, paid for the colt to Cora's account. Selected a dress skirt and went to The Newton lecture. Came home at 5.30. Did evening work. 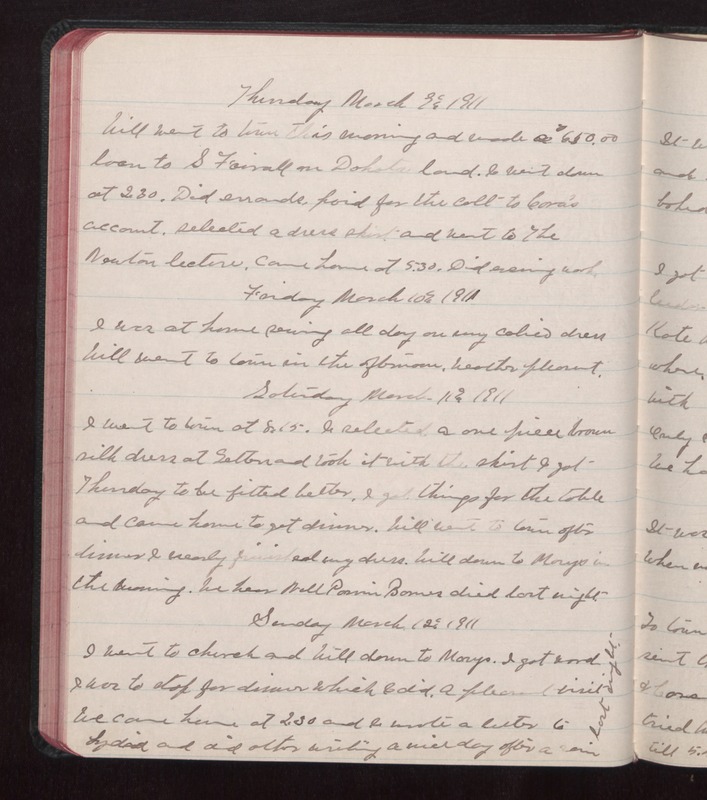 Friday March 10 1911 I was at home sewing all day on my calico dress Will went to town in the afternoon. Weather pleasant. Saturday March 11 1911 I went to town at 8.15. I selected a one piece brown silk dress at [Getton?] and took it with the skirt I got Thursday to be fitted better. I got things for the table and came home to get dinner. Will went to town after dinner I nearly finished my dress. Will down to Marys in the [morning?]. We hear Nell [Parris?] [Barnes?] died last night. Sunday March 12 1911 I went to church and Will down to Marys. I got word I was to stop for dinner which I did. A pleasant visit we came home at 2.30 and I wrote a letter to Lydia and did other writing a nice day after a rain last night.